Shall we socialize? – Start now learning! The Facilitator chooses 4 or 5 jungle animals which always move and live in groups as a community, for example Monkey, Lion, Elephant, Deer, and Zebra. The Facilitator prepares small papers with the animals he/she decides, equally divided according to the number of participants, folds and puts them in a hat or box. Each participant has to pick up a paper to read what animal they represent and hide it without revealing to others anything. The Facilitator gives a minute to participants to think, silently, without moving their bodies, one characteristic body move representing the specific animal. The Facilitator puts the Conga Song (Gloria Estefan) and asks participants to mingle, walk normally as people, around the room, imagining they are walking in the jungle. Their goal is to find their peers and form their animal group to socialize. The Facilitator explains that when the music stops suddenly (and it will stop several times during the song), each has to stand in any person they find in front of them and perform their animal move/act as a signal to their peers. If two participants perform moves/acts representing the same animal, then when the music starts playing again, they continue walking as people around the room, holding hands. When the music stops again, both do their animal moves, to the person or group they find in front of them to find more peers. This continues until participants find all their peers and form their animal group. If there is still time, when all animal groups are formed, participants start celebrate finding their peers in their groups, by dancing the Conga in a circle or in a line. The little papers with the animals need to be prepared on equal numbers, based on the number of participants. The Facilitator needs to stop the song every few seconds to prolong the energizer and give the chance to people to find their peers. If people want the Facilitator at the end can put the song or a similar song for all the groups to dance, celebrating their success in the “jungle” and get more energized in a fun and relaxed way. If the Facilitator wants, he/she can mention than since the beginning of time all beings on earth had the need to live in a social group to survive and maintain healthy mental and physical state. The Facilitator says, “So you see a person you want to approach, how much time does it take to formulate first impressions? Let us find out!”. He asks participants to take a seat on a chair, on any table, without thinking who is sitting opposite them. Then the facilitator stands in the middle of the tables and explains the rules. Each participant has 5 minutes to get to know the other person sitting opposite them and when the bell rings the people on the right side of the table will have to move and sit to the chair on the next table (please note that it is up to the facilitator to decide from which side of the table people will be moving, depending on the way tables will be placed in the room). The same continues until all participants meet each other. At the end of the exercise a group discussion follows. 1) How did you feel trying to get to know a person in only 5 minutes? 2) Do you feel that you learn something about the personality and character of the person sitting opposite you? 3) Do you believe that 5 minutes where enough to formulate an idea of the person sitting opposite you? 4) Did you feel the need to spend more time with some of the people you met during the exercise, to get to know them better? More questions can be formulated by the facilitator. Materials: Appendix 1 (Infographic), Flipchart Paper, A3 Paper, pens, pencils, markers. The Facilitator mentions that, as in everything in life, some skills and competences are important to foster socializing and establishment of healthy social relationships with people. Some people, due to their character or lifestyle are open, sociable and easily establish relationships with others, whereas there are people who are more introvert and need to work on their social skills and competences, both on a personal and professional life, not to feel excluded or isolated. The Facilitator divides the group into sub-groups of 5 people and places A3 papers in the middle. The groups are then asked to write down “What are social skills – give your own definition – and why they are important?” Approximately 15 minutes is given for this. At the end of each group presents their definition, with the facilitator giving his/her definition as well. This might take 10 minutes. The definition given by the Facilitator can be the following “Social skills are those strategies and techniques we use when relating to or with other people”. Then he/she continues to the next part of the exercise by saying “So what do you think these social skills are based on your personal experiences, something you have seen, experienced or heard about?”. The Facilitator asks groups to take A3 papers, and create a poster promoting Social Skills. Posters should include social skills starting from the initiates of the word S.O.C.I.A.L. For example: Show Respect, Open Body Language, Cooperation, Initiating Communication, Accept Opinions, Accept Criticism, Listening. Participants are encouraged to a) be innovative in presentation, b) add as many social skills as possible apart from the 6 starting from the word “social”, c) be ready to present them in a pleasant and humorous way. This group exercise might take 20 minutes and 15 minutes for presentation. At the end, the Facilitator shows Appendix 1: Important Social Skills. Posters can be posted on walls, and photos can be posted on social media tools, including Facebook. Materials: Appendix 2 (Cards), Round Number Cards (1-5) with a holder, Appendix 3 (Form), Hat or Box, Timer, Bell, Tape, Flipchart Paper, A3 Paper, pens, pencils, markers. Participants who do not wish to participant can act as one of the judges. The judges must sit in such a position so as to have clear visibility to all acts performed during the game. The time provided for each act may change according to the size of the group. Rules must be clearly explained to participants before the launch of the game. It is recommended to use and cut all emotions cards from the appendix to have a variety available to participants. Preparation: The Facilitator a) folds all emotion cards and places them in a hat or a box before the exercise, b) divides the room, using a tape, into two equal spaces, the RED AREA and the WHITE AREA and c) prepares the Number Cards, from 1-5 (1 is poor and 5 is excellent) on round-shaped cartons with a holder. Implementation: The Facilitator at the beginning of the exercise explains to the group that the exercise is called Social Battlefield and is based on role plays and theatrical tools, and the aim is to practice social skills, when facing behaviors or attitudes which are difficult or strange. He/She divides the group into 2 teams, the RED team and the WHITE team and asks participants to move to the space representing their team, putting their seats in way facing the other team. The procedure of the game is the following: a) The two teams are competing on social skills and the Facilitator and 2 other staff members will be the Judges. b) The two teams will throw a coin to see who will start first. c) Each team will take turns in playing the game and all team members will participate at the game. d) A participant from the 1st team will run to pick an Emotion Card from the hat/box. He/She has to read the card and demonstrate in action the emotion to his/her other team members. The “actor” can use talking, moving, face expressions or any other tool to demonstrate the emotion. The other team members have to respond to their “actor” using excellent social skills. The team has 3 minutes to perform their act. e) At the end of 3 minutes the facilitator rings the bell and the judges have to silently rate the act of the team on the Social Skill Evaluation Form. f) Then a member of the 2nd team runs and picks up an Emotion Card from the hat/box and the procedure is repeated. The game can last from 60-80 minutes. At the end of the game the points are being calculated by the judges and the winning team is announced. The Facilitator launches this exercise by saying “Does Socializing connects with Health? Do we need an active social life to be healthy? Let us find out!”. Before proceeding, the Facilitator emphasizes that during the following exercise anybody, who does not feel comfortable or feels uneasy, can stop. Then, the Facilitator asks all participants to switch off or silence their mobiles/electronic devices and asks them to come forward and place them in a box. No electronic devices are allowed during the exercise. Then each participant is asked to pick a chair and sit 1-2 meters in front of a wall, within the room, far away from each other. The rules of the exercise explained by the Facilitator are the following: 1) This is an individual reflection exercise, 2) Participants have to stay sited on the chair the whole time, 3) No talking or interaction with others is allowed, 4) Complete silence is required, 5) Discipline, respect to others, seriousness and maturity are essential and 6) Real efforts must be made to get into the assigned role. As soon as the participants take their places, the Facilitator starts narrating the following story and asks participants to visualize that they are the protagonist of the story and try to get into his skin. “Imagine and visualize that you are John, a very active young man, 25 years old, who at some point got tired from work, got upset with your parents for trying to control your life, got tired of having people around and got into fight with your best friends over a not so important reason. At a moment of impulse, you pick up your car, leave a note to your parents and decided to go and live in an isolated cabin on the top of a mountain. Before arriving, you stop and you buy the necessary supplies to survive on your own on the mountain. You arrive at the cabin, and you are completely alone, in a very quiet environment, with no electronic devices, no radio, no TV, no camera, no mobile, no laptop. Completely shut down from the outside world. You are certain that you do not want to go back to society, and you want to be isolated without having to socialize with anybody. Can you live like this?”. All participants must stay isolated, sitting on their chair opposite the wall for 20 minutes. At the end of the exercise, the Facilitator asks participants to pick up their chairs, sit in a circle in the middle of the room and distributes the Appendix 4 (Form “Isolation Is it Healthy for us?”). The Facilitator asks participants to reflect on the isolation time spent as the character in the story, concentrate and fill out the form with complete honesty. In total 15 minutes is given to participants to fill out the form. Then the Facilitator presents 3 Flipchart papers with the same title on top “Isolation: Is it Healthy for us?” and under with a different subtitle: Feelings – Thoughts – Wishes. The papers will be divided into two columns, in one a Happy face will be drawn for positive conclusions and in the other a Sad Face will be drawn for negative conclusions like in the following example. The Facilitator places the Flipchart papers on the floor, and asks participants to write their words/phases, from the last question on their paper, on post-its and put them other each column, based on negative or positive conclusions. It is estimated that this will take 5 minutes. So what is it good for our Health? Isolation or Socialization? Can you name some methods or means for socialization with others? The Facilitator can write down these methods or/and means on the flipchart. Is it easy or difficult to establish a healthy social life? Is there a boundary or limit in age in establishing a healthy social life? This discussion will lead to the next exercise which refers to social skills. Materials: Flipchart Paper, Appendix 5: Characteristics of a Healthy Relationship, A3 Paper, old magazines, glues, pens, pencils, markers. The Facilitator explains that the exercise has to do with establishing and maintaining healthy relationships at home, schools, work and our environment in general. Participants are urged to visualize that with their poster they will promote the basic and most important characteristics to maintain a healthy relationship with friends, family members, acquaintances and others. divides the group into smaller groups of 6 participants and distributes an A3 paper. 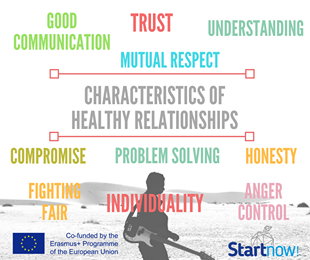 The groups are asked to prepare a Poster with the Characteristics of a Healthy Relationship, based on what they have learned during the modules, their personal experiences, their discussions and conclusions. The groups are urged to be creative, innovative and use any material they wish (drawing, collage and others). This exercise lasts approximately 20 minutes. At the end all posters are presented, photographed and posted on the walls and on the Facebook pages. At the end the facilitator also presents Appendix 5: Characteristics of a Healthy Relationship, as a reference.